WESTERN : SAHARA" by Left Hand Rotation collective, interventional screening in Exarchia square in the context of "To The Future Public : Después del Futuro / بعد المستقبل / After the Future / Μετά το μέλλον" in collaboration with Jose Iglesias G Arenal & Charo Romero Donaire, and the assembly of the autonomous "House of Refugees". Western Sahara is the last colony to set free in Africa. Over 37 years ago, when Spain abandoned the Saharawi people, Morocco occupied the territory under international tolerance. This situation has produced more than 200,000 refugees in Algerian lands. The Saharawi people today are torn between two paths: to continue peaceful resistance or to return to arms. Noam Chomsky has argued that the so-called “Arab Spring” did not begin in Tunisia, but rather, it began in the Western Sahara, pointing to the October 2010 protests in Gdeim Izik as the beginning of the “Arab Spring.” Moroccan security forces brutally repressed the protests, resulting in the death of eleven people, and several hundred others were injured. The Western Saharan struggle, while also comprised of socioeconomic grievances and a desire for political freedoms, dates back to the mid-twentieth century and grew out of a colonial context, involving territorial disputes that have continued to last into today. It was entrenched in the Cold War politics that fueled many conflicts throughout the world. The matter of self-determination is an aspect of the struggle that cannot be categorized under the generalizations of what the “Arab Spring” narrative assumes: that the protests, uprisings, and movements in the Middle East and North Africa emerged from a vacuum and that they can all be labeled as a collective phenomenon with a common goal and shared outcomes. 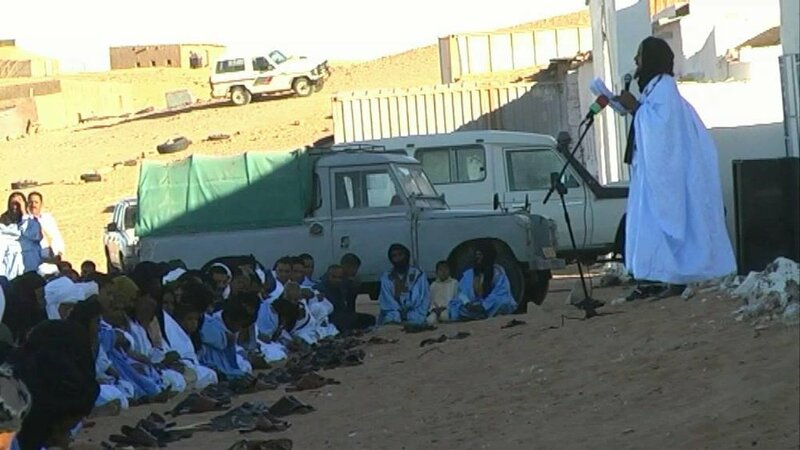 "In this history of Western Sahara, the fate of Europe is in the hands of the Saharawi people". - resident of Tindouf refugee camp. Screenings, public actions and workshop organised in collaboration with Jose Iglesias G Arenal & Charo Romero Donaire, and the assembly of the autonomous "House of Refugees".